We’ve debunked it before, but this photo just won’t go away. The 1948 picture above doesn’t show Albert Einstein with his therapist. The guy Einstein’s meeting with is Cord Meyer, Jr., president of the United World Federalists. Meyer, a CIA operative, was merely discussing world politics with the famed scientist. If you follow history accounts on social media, you’ve probably seen this photo pop up dozens of times over the past few years. 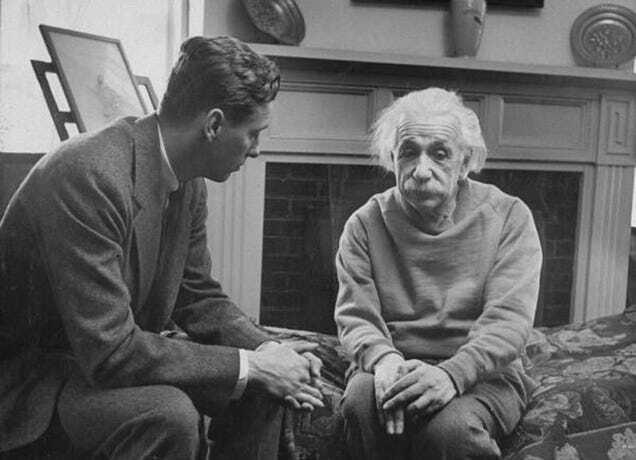 Twitter accounts like HistoricalPics, HistoryInPix, History_Pics — they all share the photo with a misleading caption about Einstein in therapy because they know it’ll get thousands of retweets. The caption often includes the phrase, “Happiness in intelligent people is the rarest thing I know.” Naturally, this phrase resonates with us because most of us fancy ourselves smarter than average and yet are often depressed about our own circumstances or the state of the world. See, even Einstein got depressed! Smart people have a special mental burden to endure, the photo seems to say. But this meme needs to die. The more reputable (and I use that term loosely) historical picture accounts on Twitter will sometimes stop circulating fake images when they’re called on a particular error. But for whatever reason, this Einstein photo keeps doing the rounds. So if you see this photo pop up on your Facebooks or your Twitters or your Grams, Insta or otherwise, do your part. If you see something, say something. Only you can prevent bad historical memes online.